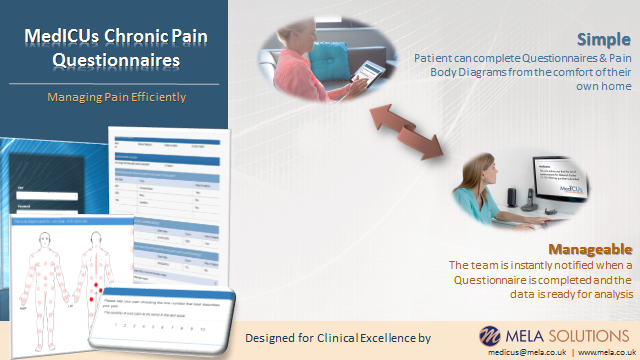 Mela Solutions aim is to provide an innovative tool that will improve patients’ outcomes and will reduce the overall number of patients suffering from Chronic Pain. In the UK there are more 8 million adults suffer from chronic pain and 41% are not able to work, therefore Chronic Pain can have a serious impact on the quality of individuals. (Policy Connect, 2017). 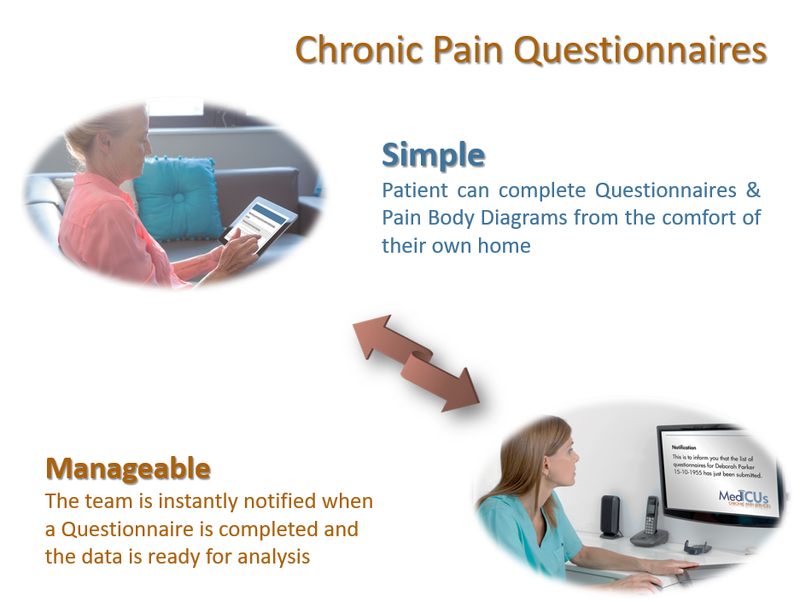 We will develop a tool to be used by chronic pain teams to demonstrate the effectiveness of pain treatment by analysing patient questionnaires, a unique feature in the medical data collection management. The proposed solution is the development of web questionnaires that can be accessed by the patient from the comfort of their own home. Enabling patients to complete questionnaires from home, will provide a timely response for both clinicians and patients. This project will facilitate the gathering of data, that will expose the magnitude of the condition, the effectiveness of the treatment and the reasons why there are long waiting lists for consultations. Chronic pain is associated with prolonged suffering. Many of these patients will experience conditions that sometimes evolve into a complex disease state. Therefore, these patients are likely to have repeated visits to hospitals or clinics and have multiple specialist consultations. The objective of this project is to shorten the length of the condition by providing a tool to help to improve the effectiveness of care. As a result, the patients will have fewer consultations and waiting lists will be reduced. Once this tool is implemented, we will conduct a study to measure the effectiveness of this digital solution in medical practices. 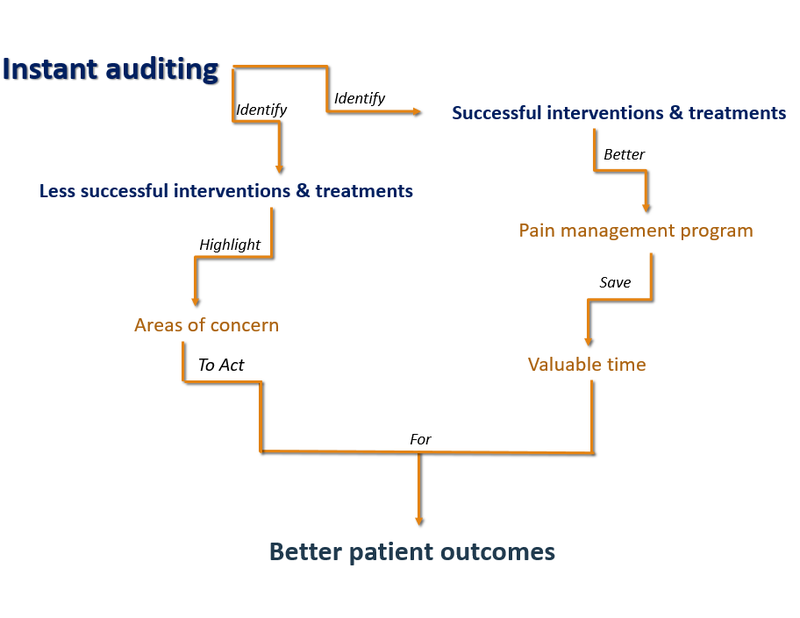 Additionally, we will make a comparison between the initial implementation phase and one year afterwards to identify the trends and changes in the patient outcomes. We will follow this with a publication in a magazine highlighting the results of our study: the number of patients suffering from chronic pain, treatments received, risks factors, number of consultation, the average period of suffering and the outcome of the treatment received.